The following is not directly related to the work of solid-state lighting, but does reflect a situation that others have found themselves in related to organizations and the industry that solid-state lighting exists within. I offer it as a personal insight and experience with one of lighting’s major organizations – perhaps offering comfort to others in similar situations. In 1985, after working as a lighting designer and electrical systems designer for 4 years, completing numerous lighting educational courses independently, through GE and Sylvania, and the IES, I felt it appropriate, and timely to join what I believed was the ultimate brotherhood of lighting designers. I carefully completed the application with proper supporting documentation for that time, and was accepted as an Associate member of the IALD in June, 1985. My goal was to continue to advance my skills and capabilities and do what I could for the lighting industry, as well as my lighting customers. When I achieved 10 years experience, I planned to submit application for full membership. Lighting was my job full-time at this point, and I was an enthusiastic young professional looking forward to making it a long and rewarding career in what I found an exciting and inspiring industry. My first IALD certificate. For me a symbol of belonging to something larger than my individual efforts. In the intervening 9 years from 1985-1994, I was active as a lighting designer, but also began working with manufacturers to produce products the market needed. This included consulting design work for Marco, Capri, Winona Lighting, and several others, designing products for customer specific projects, as well as general designs targeted at retail application. Finding it continually frustrating to find products with the qualities I needed to complete lighting projects, I was drawn into more and more product design work. I was in good company, as this was the time when folks like Bill Lam, Silvan Shemitz, and numerous others had moved into product development to build better solutions to lighting design problems. This path was the path of the great Thomas Edison, who acted as product and application design entrepreneur in an effort to not only promote product deployment, but improve lighting as a whole. I saw no conflict in the pursuit of both lighting application design and product design and development simultaneously. I made every effort to insure that when any potential conflict of interest arose, I informed the customer, and either withdrew my participation, or excluded any manufacturer I was working with at the time from consideration – which was a little paradoxical at times, since the products being developed were specifically targeted at application customer needs.. But, I accepted this. As a career, in this same time period, I was torn between consulting work and working as an in-house designer for manufacturers. I decided to try the more direct relationship with Winona Lighting, in 1989, as Director of Design. I continued to provide a limited amount of Lighting Design consulting work, after assisting a friend take over my major customers still active as a lighting consultant. This was a particularly difficult choice to make, as I was President of the Las Vegas Chapter of the IES at the time. I was compelled to make the move based on the exciting potential of bringing products to market that met the needs I found unmet as a designer, while still actively engaging with application customers independent of Winona, and through Winona’s interaction with some of the most well-recognized lighting consultants in the USA. This led to my moving on to Visa lighting with a similar position, but larger organization, increasing the potential for offering greater reach of viable product solutions. 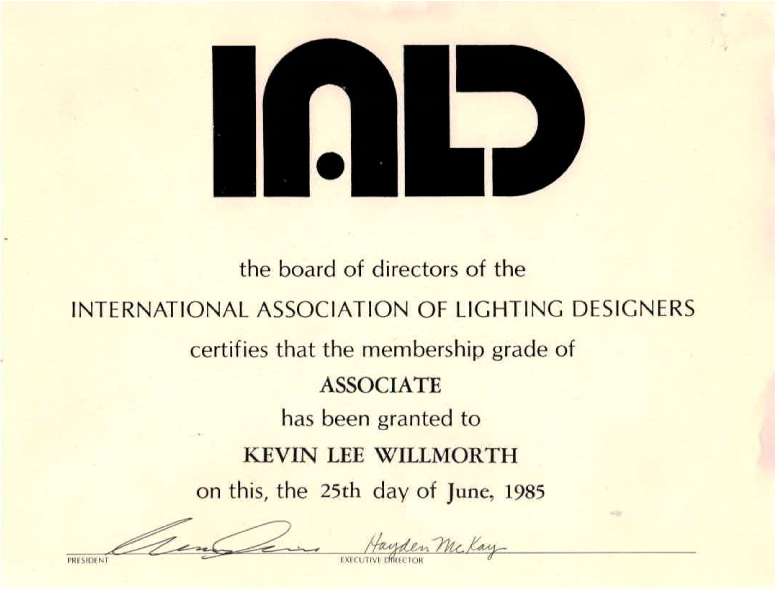 1994- Discharged as an associate member of the IALD. For a young professional, letters like this, without any review or communication prior, are taken personally and with gravity. This letter came with no warning or other communication to verify the eligibility conflict or learn of my position. This was my response to the letter from the IALD, reflecting my feelings and position at the time. 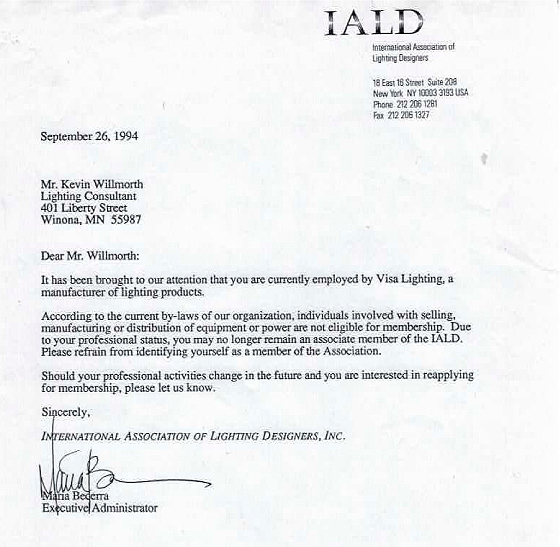 There was no response to this letter of any kind, nor had anyone in the IALD contacted me, then or since. For several years, stung by what felt like a rejection of my contributions by an organization I held in high regard, I abstained from pursuing the IALD, stopped promoting the organization. At some point, the creation of affiliate status allowed me to reconnect. I was asked by several of my technical customers at the time whether this was a way for them to contribute, and in review, and with no other alternative, I re-applied for affiliate status, very reluctantly, as it did not represent my activities as a design entity that delivers both product and application project work with equal vigor and interest in connecting end use need with products to fill those needs. I was also drawn to membership in the LIRC, but found myself feeling useless as a very small voice in a sea of corporate marketers, so resigned from that activity soon after. In 2006, I moved from employment with luminaire manufactures and rebuilt my firm Lumenique as my home for all activity, which includes the mix of application design, product design, consulting to end-user owners, and manufacturers. I also make a line of my own task lighting product. I never bothered to redress member positioning, as I am still a bit put off by the way I was tossed to the curb so many years ago. The luster of the organization has been tarnished for me personally, so I have remained a an affiliate, paying the dues, but not actually actively promoting or maintained any real involvement with it. My dues payment comes at the end of each year, which is now. In review of my feelings about the organization, the position it has boxed me into (without a single conversation with me personally), and any benefit I see in remaining in this state of limbo of sorts, I have decided to pass, and allow the affiliate status lapse. Over the years I have witnessed the organization back the NCQLP LC program that awards LC status to sales representatives, manufacturer regional managers working for manufacturers who have never designed a single project, and numerous others who have never headed a design project, or ever worked directly for an end use customer, architect, interior designer, or design build contractor, beyond a sales role. I have seen the LC tag on letterhead and signatures of individuals I know for a fact have not a single clue what is involved in lighting design. How can this be the case, when being associated with a manufacturer (including sales channel members) results in a persona non-grata status as a member of the IALD itself? I have also seen the organization give the cold shoulder to some truly stellar potential members who once saw it as a pathway to deliver new value to the community, and show open hostility to the growth of emerging new technologies. I accept that the IES has filled its ranks with sales, manufacturing, marketing, distribution and contracting members – overwhelming the ranks of actual “illuminating Engineering” professionals, this has been its makeup from its inception. Conversely, the IALD has been playing the part of exclusionary organization, while offering credibility to those who cannot qualify as Associate or Professional Membership in the organization itself – by its own hallowed by-laws. These, and other odd experiences over the years (won’t bore anyone with the details here) has left me feeling it is time to change. This all said, and still with some reluctance, I have decided to move on from direct support of the IALD as an organization. 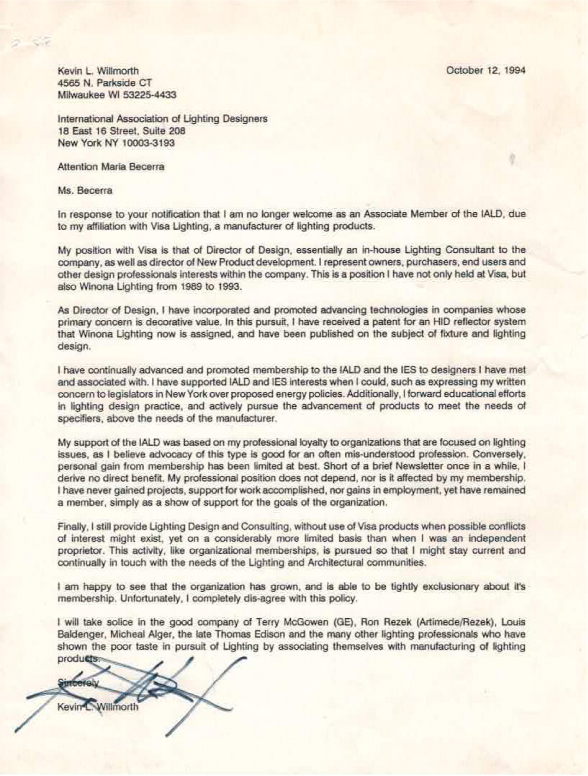 I remain a full supporter of the Lighting Profession, and all those who are engaged in the work of building a better industry as a whole. I remain committed to providing editorial content that inspires fresh thinking and insight, to delivering assistance to manufacturers interested in creating valuable products to lighting customers, to lighting customers seeking excellence in lighting performance, and advancing the knowledge of new entries into the market in both application and product levels. I remain committed to the lighting industry as my home, as I am uniquely connected to it in so many ways. I do not need the IALD to do any of these things, and the IALD has shown it does not desire me as a participant in what it does in its own efforts in these directions. Thus, it appears there is a very real “disconnect of interests”. I am a bit saddened that I was never able to have any impact or contribute to the IALD in a meaningful way beyond paying annual dues. While I accept that some of this is my own fault for not making a more direct plea or effort to change any of this, it is very difficult to get past feeling the fight taken out so early in my three and a half decade long career in light – combined with being reasonably busy doing what I do – taking priority of time and energies directed elsewhere. I am sure both the IALD and I will do just fine pursuing our own destinies, individually and separately, while traveling the same paths into lighting’s future.